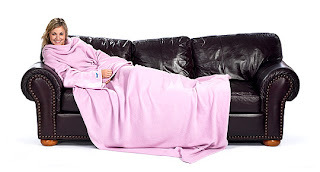 I wrote about The Slanket during our Tea Party and was positively thrilled at the concept of a blanket with sleeves. But did you know that they make a smaller version for children? It's true! The Slanket Kids is a mini-me of regular Slankets. I actually prefer this size for myself, too, being a smaller adult at only 5'2". It would be a great airplane travel blanket for petite grown-ups or kids. And it's snuggly as could be. I wish I could get a decent picture of Roo all wrapped up in The Slanket Kids but they all look like she's swaddled in maroon fleece, like a tiny Jabba the Hut. Her only complaint about The Slanket Kids? "It should come in pink or maybe purple." Shouldn't everything? Aww. My little bitty MIL would fit in the kids one too. I'm a towering Amazon at 5 ft 8 so I might have to get an XL. Pink is a must! Happy New Year! Yes, everything should be pink and purple, at least for little girls. I laughed imagining her as a mini Jabba the Hut. Slanket kids? #1 son would love this!